In this interview series we ask questions to people who are making a difference in our society, it can be big, it can be small, it doesn’t matter, what matters is their contribution. It can be anyone from any walk of life and from any country. Please, do send us suggestions of people whom you think we should interview for this series. 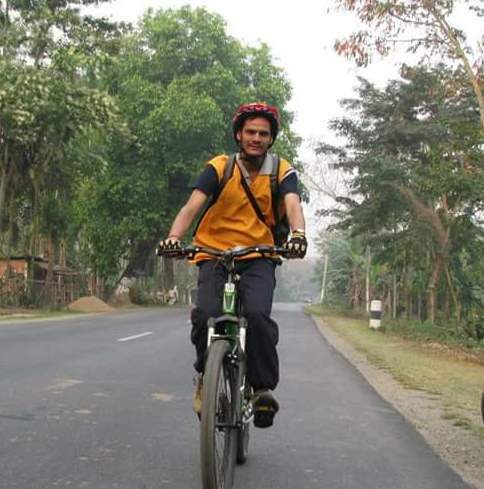 Devendra Tiwari is a mountain climbing, bicycling and adventure sports enthusiast from Gwalior. He tries to combine his skills with social work and has lead expeditions with differently abled children to mountains and trekking trips. Following is the transcript of our conversation. I am from a rural background, my village Ujaawal is about 60 km from Gwalior. Parents sent me to study in Gwalior, I did graduation in arts and from an early age I use to go in shakhas of Sangh and Hindu Mahasabha and from there I got the inspiration to work for the society. I always liked being close to nature, I thought to mix my interests, Trekking and mountaineering, with social work. I biked from Gwalior to Porbander for a Clean India campaign; I lead an expedition of 15 children with hearing and speaking challenge to Himachal Pradesh, Rungto Top which is at the height of around 13500 ft. I have mother and two brothers in my family. How did you got interested in trekking and mountain biking? One of my uncle, had in interest in trekking and I use to hang out with him and company him on trekking trips in forests around Gwalior. In 1996 I came in association with YHAI (Youth Hostel Association of India) and joined them on a trekking trip to Pachmarhi, I liked mountaineering too and especially Himalayas, I have been to Rohtang pass, saurkundi pass, sar pass, kedarkantha, chandra kani pass. Last year, I went to friendship peak, Solang valley with Tiger adventure foundation. Once, I read about two foreigners visiting Leh-Ladakh on bicycle, 2004 which made me think if they can do it I can too. When I was in Kullu, I took an ordinary cycle to bike to Jalori Pass. I suggested YHAI to promote this route and now it’s open to common people. In 2009, I went to Leh-Laddak on cycle on a trip sponsored by YHAI, I was the only one from Gwalior in a group of 120 people from all over the country. What would be your advice to people who are interested in adventure sports? There are two type of people who are interested in these sports, one who are really interested, they want to be close to nature and care about it, they want to challenge themselves and enjoy doing it and then there are others for whom it’s just a trend, their sole purpose is to take selfie, consume alcohol and party. They often end up polluting these places, I’d tell them to take it seriously and show respect to nature. Why did you choose to work for differently abled children? Where I lived in childhood, a lady, our neighbor, was unable to hear or speak but she seemed very happy & jovial. She use to communicate with sign language, even though she could not hear or listen but she sought happiness, there are many like her who may be poor or lack resources but are very happy indeed. I wanted to do something for these people, especially for kids, I wanted to show them mountains. So I’d say, that lady was an inspiration. I tried luck in Gwalior to take the disabled kids to a mountaineering expedition but didn’t succeed. Then in 2015, in an event by Tiger adventure foundation in Mysore, we visited 3 schools in the area for hearing and speech disabled kids. One school agreed for this trip, so we organized a race to pick our candidates but we chose the 15 students who came last and started training them, world always pick winners but we wanted the losers to climb these peaks. The kids or their school hardly had any resources but through generous support arrangements were made, these kids did trekking, water rafting and mountain climbing, it also a first time they flew in an airplane. At the end, they were felicitated by governor of Haryana, Shri. Kaptan Singh Solanki at governor’s residence and certificates were distributed as well. It was very motivational experience. How did you trained and motivated these kids for such rigorous expeditions? In Mysore training camp at Chamundi Hill, we trained them in rock climbing, rappelling, physical and mountaineering training. Besides this we used videos, pictures and sign language but the children were very hard working and enthusiastic. Do you think Indian government and society in general is doing enough for these children? So far things were ok but after current government come the word disabled was removed, our prime minister gave the term, “divyang” or divinely blessed, it was a motivating factor and society also changed its outlook. On Dec 27, 2016 person with disability act has changed a lot of things, people are more alert, efforts are made to bring these kids in mainstream, it has been long overdue but the turning point finally came. Current government, society and youth of today are proactively engaging and a sense of support is there. You have been to some of the most serene, natural places in India but what are your thoughts on the pollution problem in our towns and cities? We also organized cleaning drive from time to time, once we did a cleaning drive at Rohtang Pass in 2009 with YHAI, we collected wastes materials for 15 days and talked to people about cleanliness at natural places, we collected about 10 ton of waste like plastic bottles littered by tourists and delivered it to district collector’s office for disposal. What are your interests outside this field? I like reading novels, history, biographies, travelling. Understanding other cultures and meeting new people. I have a dream to cover Europe on cycle and spread the message of Vasudhaiva Kutumbakam which means whole world is a family, that’s the target for next year. I aim to cover 10 nations on cycle, meet new people and teach them about India. I also want to work towards education of disabled children; DEMS (Deaf Education and Multitasking Society) and its lead Ms. Megha Gupta in Gwalior are doing a phenomenal work in this field. Despite lack of resources, they are dedicated to the cause of uplifting these children. I got deeply involved with DEMS and want to support this organization its students. Your message for our readers? My message is that human birth is very precious; we should make effort to give back society and fellow human beings, it should be priority in our lives. Yes, wealth, money is important but the country and society is important too. Bravo ! Keep it Up. Go for inter Continental Cycling. Jai Swamiji. God Bless You. The likes of Devendra Tiwari are the need of the hour for the country to take care of the disabled and the Nature.